The Embarrassment formed in Wichita, Kansas in 1979. 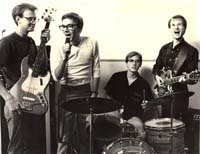 The group consisted of John Nichols - vocals, organ; Bill Goffrier, vocals, guitar; Brent "Woody" Giessmann, drums; Ronnie Klaus, bass (aka "Captain Ron" circa 2006). Bill, John, and Woody more or less grew up together, started a punk rock trio in 1977, and eventually found a comfortable chemistry with the Embo line-up. They recorded between November 1979 and May 1983, touring and playing out more or less continuously during this time. The group broke up in June 1983. Their discography, studio recording history, and some documentation evidence about their live gigs are documented elsewhere on these pages. Giessmann went on to be the drummer in the Boston-based Del Fuegos during their major-label career, later drumming with the Laurie Geltman band, and a later line-up of Big Dipper, and continues to be in demand as a session drummer. 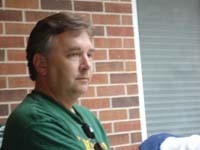 Goffrier and Gary Waleik founded Big Dipper in Boston as Bill was completing graduate studies in painting. When Gary retired from Dipper, Bill continued with Woody as Saucer, which reportedly recorded an unreleased album, but this project never surfaced in public. Nichols and Klaus pursued non-music interests after the group broke up. The group "reunited" for several legendary gigs in Kansas in 1985-86, and reformed as a "side" project in 1988. 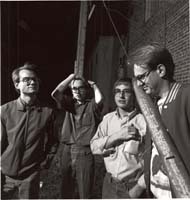 The reformed Embarrassment laid down some basic tracks in Wichita in 1988 and 1989, and recorded the remainder of tracks for a CD in Cambridge, MA September, 1989, which was released in 1990 as God Help Us. The group toured six cities and played a few gigs in Kansas in the fall of 1989; the one I attended on September 7, 1989 in Boston, around the time the CD was recorded, was incredibly taut and rocking, far better than any Big Dipper or Del Fuegos concert I'd been to, leading one to wonder why they ever broke up in the first place. After a long hiatus, the band reunited for three concerts in 2006. These were at the Roadhouse Blues in Wichita on August 18-19, 2006, and at Liberty Hall in Lawrence August 20, 2006. 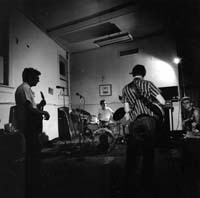 The band is the subject of a documentary film-in-progress. The band, minus Ronnie but with the addition of bassist Eric Cale, performed in Wichita for one evening in 2008. The songs were generally in the 3-minute rock variety, but ranged from Joy-Division-like grind to bouncy pop. They tended to be non-linear lyrically but have a rather operatic quality, often building to a strange crescendo. Their range of live covers went from 60s soul to Michael Jackson and Elvis Presley to John Lennon. The lyrics were almost always humorous with a semi-serious edge and occasional arty pretensions, and read in a certain way tended to be rather dark if sardonic. The lyrics often covered odd topics: mathematicians, explorers, B-movie horror scenes, 60s TV, driving through a middle american town. The band wrote together, often piecing together germs of ideas from particular members, and Bill and Brent provided excellent backing vocals. As musicians, they sound clear and polished on record, but were a legendarily noisy and danceable band live (and still were at their 2006 reunion). Goffrier's guitar could pound out a jangly three-chord sequence or veer into punk roar that would shame Joey Ramone. Giessman's drumming had a manic quality that never showed up in his later Del Fuegos work, and ultimately he may have been the best musician in the group. Ron Klaus' bass popped and nearly jangled at times. And John Nichols' superb vocals delivered the lyrics articulately and with incredible phrasing, something not common to most indie acts of the era. Nichols also played a strangely minimalistic organ, piped through effects boxes that made it sound like a wall-of-sound guitar at times and a tinny farfisa at others. The band as a group affected a nerdy, reedy look that was appropriate for some of the more introspective lyrical jaunts but which clashed with the band's rocking sound. As far as an image, it was more or less who they were: former art students concentrating more on sounding good than trying to puff up for the press shots. That image, their origins in the middle of the country far away from the hipster scenes on the coasts, and their strangely honest name conspired to make them almost unmarketable to a wider audience, and they never got a record contract except on self-published and local labels. In many ways, I tend to think of them as a group to listen to while driving some backroad: rhythmic, fast, quirky yet all-American like the landscape. My personal opinion is that they were one of the best bands, period, of the 1980s, and represent a high point in Amer-indie rock following the punk period. You can read a little more about them on the web at Perfect Sound Forever's Embarrrassment Tribute Site, and at the Bar/None's Embarrassment biography page. There are also sketchy details about the band on the liner notes of The Embarrassment Retrospective Tape and Heyday. A longer history of the group may be posted here at some point. Continues to perform and write his own songs. He is now a licensed counselor, and the CEO of Right Turn, a company which provides counseling and therapy services for musicians with substance abuse problems. He was married to Elissa Schwartz in October, 1996, and has two children. Taught art in the Boston area, he recently returned to Wichita and continues to paint along with writing new songs. He has one child. He has also sung and acted with the Boston Rock Opera. Spent the intervening years in Phoenix, Arizona. Despite reports to the contrary, he is not either the Captain of a Whale Watching boat nor preparing to sail around the world. 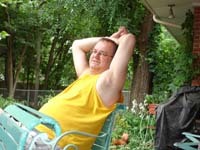 He splits his time pursuing business interests in Phoenix and with family in Costa Rica. John Nichols works for an airline out of Florida. His hair is as uncontrollable as ever, his fingers pushing it everywhere, and he continues to write lyrics for songs.